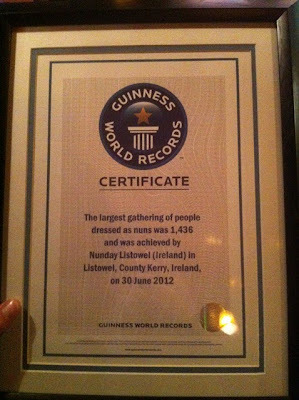 On Tueday night last (28th August 2012) in John B Keane's Bar, the official letter and certificate was received from the Guiness World Record Book that Nunday had achieved their World Record attempt with 1,436 nuns gathered in Frank Sheehy Park home of Listowel Emmets GAA on Saturday 30th June. Congratulations to the Nunday committee and in particular to Cora & Martin O'Brien for all their hard work. The idea was the brainchild of Cora O'Brien with all money raised (€27,300) on the day going to Pieta House.